A trip to the city of Chicago is the perfect way to spend a long weekend almost any time of the year. The city offers an incredible amount of activities, attractions, and festivals or celebrations that anyone from outside the area would love to come and take part in. The city also has a rich and distinguished history, and much of it is on display and accessible to travelers and locals alike through visiting some of the historic landmarks located there. A trip to the city of Chicago is the perfect way to spend a long weekend almost any time of the year. The city offers an incredible amount of activities, attractions, and festivals or celebrations that anyone from outside the area would love to come and take part in. The city also has a rich and distinguished history, and much of it is on display and accessible to travelers and locals alike through visiting some of the historic landmarks located there. This is not only a great way to get outside and spend time absorbing the Chicago ambiance, but is also a great way to get a feel for the history of the city up close and personal. Here are seven interesting and accessible landmarks in the city of Chicago. Founded in 1907 in Chicago, the Essanay Studios company was a motion picture studio from the silent film era. Some of the stars of the time that appeared in Essanay Studios productions include Tom Mix, Gloria Swanson, Edward Arnold, and the great Charlie Chaplin. Famed Hollywood gossip columnist Louella Parsons even worked at the studio for a time as a screenwriter. The site today is part of St. Augustine's College and visitors are welcome. Known by a number of names throughout its history, from the North American Life Insurance Building to the Pure Oil Building, 35 East Wacker is a beautifully designed building that is a stunning example of early 20th century urban architecture. At one time, the building was the tallest building outside of New York City. Film fans may recognize the building as having played a large part in the movie Batman Begins. Built in 1924, and located in the Kenwood neighborhood of Chicago, the K.A.M. Isaiah Israel Temple is a beautiful building featuring a magnificent domed roof. The architecture is inspired by the famous works of the Byzantine Period and is well worth a viewing. The building was designed by famed Chicago area architect Alfred S. Alschuler, who designed many notable buildings in the city including the once famous Chicago Mercantile Exchange, though it no longer stands. 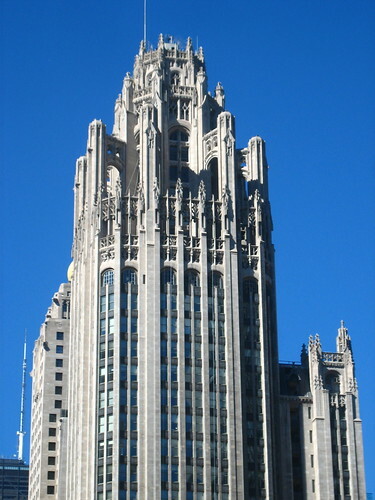 Built in the Gothic style that was very popular in urban centers during the early 1920s, the Tribune Tower stands today as one of the most recognizable buildings in Chicago. 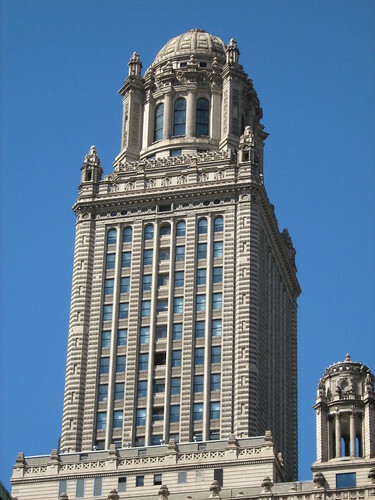 The Tribune Tower is open to the public and part of the local historic district that includes many other important downtown Chicago buildings. An interesting note for fans of he Batman films is that many of the scenes from the Batcave in the 2008 film, The Dark Knight, were filmed in the basement of the Tribune Tower. Another of the most recognizable structures in Chicago is the famous Chicago Water Tower. The design of this structure went far away from what many cities were doing when designing necessary public works structures at the time. The tower was built in 1869 and made out of Joliet limestone. It stands at just over 150 feet tall and the water it held was originally used for the purpose of firefighting. Today, it remains as the only structure left in Chicago that made it through the Great Chicago Fire of 1871. The tower's ornate stonework has been admired by tourists and locals alike for many years. Today it serves as one of the visitor's centers for the Chicago Office of Tourism. Dearborn Station stopped serving rail customers in 1971, but all these decades later it remains an important and much loved landmark in the city of Chicago. The intercity train network that developed in Chicago during the late 1800s was important to the city's development as the major population center of the Midwest, and Dearborn Station was one of the most important stops on the line. Today, the train station survives and is home to a number of retail businesses. The surrounding rail yard that once dominated the area has been painstakingly altered over the years and now is home to several parks, an elementary school, and more. Visitors to Chicago may not know it, but they are visiting the site of the oldest planetarium in the world. Built in 1930, the Adler Planetarium at the time was the first planetarium ever built in the Western Hemisphere. The planetarium is located on Northerly Island along with a number of other important museums including the Field Museum of Natural History and the Shedd Aquarium. The Adler Planetarium has another record to its name too, it is the only museum in the world with two full-size planetarium theaters in it. From its days as a fur trading location and an important part in westward expansion, up through the twentieth century as well, the city of Chicago has played a vital role in the development of a number of things. The Midwest has relied on the city for a variety of reasons for more than a hundred years both for what the city itself offers as well as the access the city has to other markets and destination via rail, road, and the waterways of Lake Michigan. Visiting Chicago's landmarks is a great way to get a grasp on the many important moments in the city's past. There is no city in America quite like Chicago, and it is a great destination for anyone deciding where to go on their next vacation. Plan your next vacation on Travelocity. Find travelocity coupon codes for added savings.